What are the basics you'll need? Are you looking for a simple to follow daycare supply list? While it is true that a home daycare business can be built over time, there are some items you'll need to acquire right away. If you have children starting in a few days, here's the list of absolute essentials you'll need to start your own in-home daycare. If you don't already have them you'll need smoke detectors, a carbon monoxide detector, fire extinguisher, flashlights or lanterns, a portable radio, outlet plugs, cabinet locks, and a first aid kit. These safety items are listed first in the daycare supply list because their importance is paramount. Your first order of business is safety. Your daycare supply list must include items normally provided by parents. Generally providers ask that diapers/wipes are supplied by parents. I always did, but on occasion the supply would run out and a parent would forget to bring more. These are items you don’t want to be short-handed on. Remember also that baby wipes come in handy for a quick hand wipe during meals or messy craft projects. You'll need a weeks worth of breakfast, lunch and snack items. Make sure your daycare supply list covers the food groups, and that there is enough so that particularly hungry children can eat enough. I had a three year old back when I started daycare. He was solidly built, though not overweight by any means. In any case, that one little boy was not only the least fussy eater I've ever served (he ate literally anything I made, not a single time did he ever tell me there was a food he didn't like), but he also ate several helpings of each food item. When a meal was over he had eaten 3-4 helpings of each item. I also should state I'm not skimpy with helpings. He out ate my son who was 6 years older than him. You may not wind up having such a robust eater in your care, but you will need to be prepared just in case. You'll learn soon enough just how much food to prepare. Start with the basics. Some type of building set such as blocks, Lincoln Logs, large Lego or Duplo sets. Cars, trucks, dolls and doll accessories. Puzzles and coloring books with crayons. 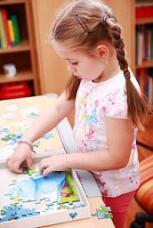 Classic games like Candyland, Chutes and Ladders and Memory. Play kitchen items and a dress up box. And books! These are the items that will keep kids busy for hours. While you are gathering your toys, remember to accept toys in good condition only. Make sure there are no missing parts, and that you have a variety for different age children. Once your home daycare is established and you are making a regular income, you’ll be able to buy new age appropriate toys specifically for the children in your care. You will also need some type of storage for all the toys. Once again, if you have children, you probably have some crafts supplies already. Your daycare supply list should include the basics of crayons, markers, paints, blunt edge scissors, paper, glue, and Play-doh. Add extra supplies like stencils, glitter, pom-poms, etc. once you have a steady income. At some point the children in your daycare will be napping. For infants and toddlers, you'll need a crib or port-a-crib. For older children you can use actual beds in your home, or purchase nap mats or cots. Should you decide to purchase mats or cots, purchase more than you think you will need right away (unless your budget is really tight). The reason I suggest this is because buying some now and some later will not necessarily result in matching ones. Buying several at a time means nap-time looks more uniform and there will be no child having a melt-down because they wanted "that one". Don't forget pillows and blankets or ask parents to provide them. And that, at a glance, is the daycare supply list of essentials you will need to get started. My guess is that after looking over the list, you already have the majority of the items that you need.